Proftpd is the world’s most popular FTP Server for linux. It allows you to connect to your linux server using a FTP client, in order to transfer files. 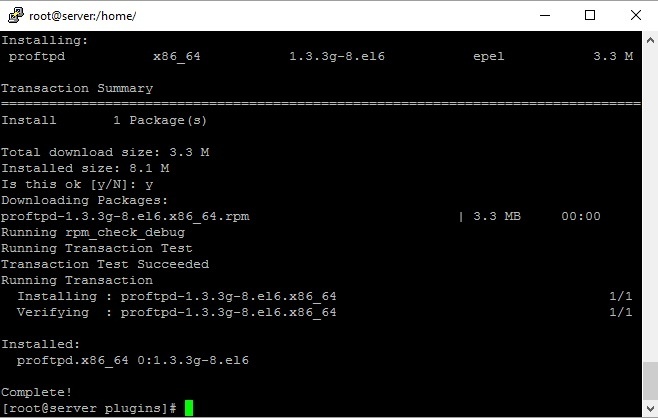 This tutorial will show you how to install Proftpd in CentOS linux. It takes less than 5 minutes. Have a CentOS 6 linux installed. Have full root access to the server. This installation can be done by Copahost technical support on our managed dedicated servers. First of all, let’s install EPEL Release repository for CentOS. Now let’s update the current modules of our server. These commands will start the service. Afterwards, we will configure it to start automatically at the boot time. We recommend installing nano editor, in order to edit proftpd config file. You can also use vim editor if you prefer. Now we need to disable SELINUX, because it may prevent linux users from logging in. We need to edit the /etc/sysconfig/selinux file. After finishing editing, press CTRL+X and then Y. Then, press ENTER to save it. Afterwards, you will need to reboot your server so that this change takes effect. Now you can open your favourite FTP client, and test your FTP site server running.